When following the footpath that meanders through St Margaret`s churchyard, pause for a while in this peaceful place, and at a point immediately south of the church, you will discover the tombstone of William Savage, Vicar of Rottingdean 1569 -1619. He was a well known Puritan minister, a man of peace and the poor people’s friend. He was a faithful servant of the church who for many years, and in times of great unrest, diligently served his flock in Rottingdean. Savage was held in high esteem by the Bishop of Chichester who bestowed upon him one other benefice; he was instituted as Rector of Ovingdean. Savage was still Vicar of Rottingdean when in 1588 Phillip II of Spain, a devout Roman Catholic, made an audacious attempt to invade England to overthrow Queen Elizabeth I and her Protestant regime. Local lore suggests that as Phillip`s Armada sailed up the English Channel, a thin sea mist eerily descended on Rottingdean. At that time the good Vicar conducted his flock to the cliff edge and there prayed that the peril to England’s shores might be averted. As history shows, Spain`s attempt to invade England badly miscarried; I am sure the good folk of Rottingdean rejoiced in having their prayers answered. 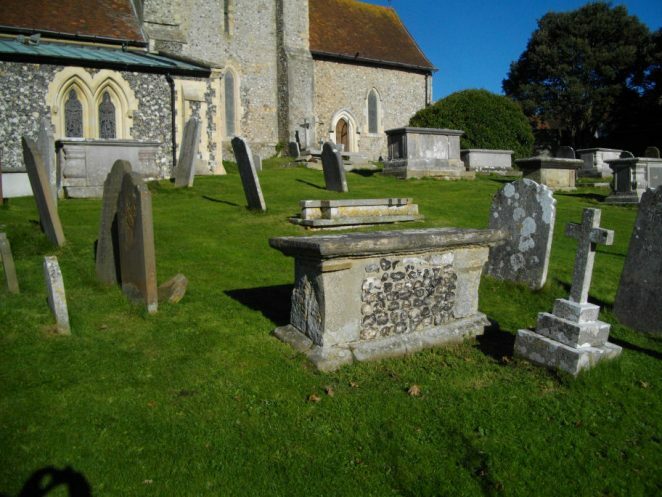 A lovely story – thank you for sharing it and, Yes, I agree St Margaret’s churchyard is a ‘peaceful place’. He was very young when appointed if the dates are correct. An aptly timed story as Gibraltar once again hits the headlines -let’s hope invasion is not imminent! In reply to Stefan`s post: Yes, William Savage was instituted as Vicar of Rottingdean at the tender age of 19 (although other sources give his birth year as 1546, meaning he would have been appointed at the age of 24). Although there is more information about him than many of his predecessors or successors, nearly all the sources give slightly differing dates for events in his life, given that this man lived more than four hundred years ago I suppose that’s hardly surprising. Savage’s history was painstakingly compiled some years ago by the historian of Ovingdean, John G Davies, to whom I am indebted for allowing me the use of his material. What a beautiful church and such a lovely setting. I was married there on the 1st June 1957. A glorious sunny day and lots of family and friends to share our “lovely day”. In the Garden of Remembrance are scattered the ashes of my Mother, my Mother-in-Law and my Wife. It has very fond memories for me.